This is the sixty-eighth of 87 letters exchanged during World War II between Nicholas Salvatore and Elizabeth Galloway. For more see Nicholas and Elizabeth. 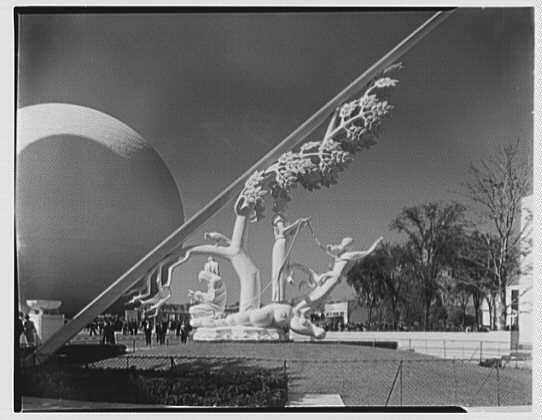 Did I ever tell you how much I wanted to go to the ’39 World’s Fair in New York? I read everything I could about it in the papers, saw the newsreels and listened about it on the radio. I begged my parents to go but my father flat out refused. The entire fair was about the future, a new dawn. There were rides and exhibits and talks of a peaceful world. Millions of people went to see it, but I guess not the right ones. Mother is back and the trip has done her well. She came back talking of trying to sell this place. Once before, right after my father disappeared, she tried to get out of here by selling it to one of the locals. Those that had the cash weren’t interested and those who were interested didn’t have the cash. Besides which, her trying to leave so soon after led to gossip in some circles that she had killed her husband. Ridiculous small town nonsense. She gave up quickly on that and fell into the mess that she became. The person that came back from New York – singing and dancing around. And laughing. God Nick, you know the last time I heard my mother laugh? Despite her new optimism though, I don’t know about getting rid of this wretched place. The crops my father tried all failed, the land never produced. Then he tried chickens. He make decent money off of the eggs one year, but something, probably a coyote, managed to break through the defenses my father constructed and snatched them away one by one. Not to mention problems with hired hands. He may have been an expensive and successful lawyer in New York, but he had no intuition when it came to hiring workers around here. We shouldn’t have ever come here. Even dad would’ve been better off sticking to his fantasy instead of trying to live it. I often wonder what would have become of this family if the depression hadn’t hit. Or if this war hadn’t happened. In the end we’re here and we’re moving forward and that’s all that matters.